A visiting hospital provides refurbishment replacement capacity for 450 procedures at Southend Hospital. As part of a wider reconfiguration of its existing services, Southend Hospital University NHS Trust planned an eight-week refurbishment of two of its existing theatres. The Trust provides acute services to almost 340,000 people. It therefore did not want this improvement work to impact negatively on patient experience or waiting times. The need was to provide a solution which would allow the Trust to continue to deliver the hundreds of general, orthopaedic, urological and oral procedures which the hospital had already planned. The answer also needed to offer a safe and clinically-appropriate environment for surgical use throughout the duration of works undertaken. Vanguard Healthcare Solutions worked alongside the management team at Southend Hospital to develop a solution using a visiting hospital unit. 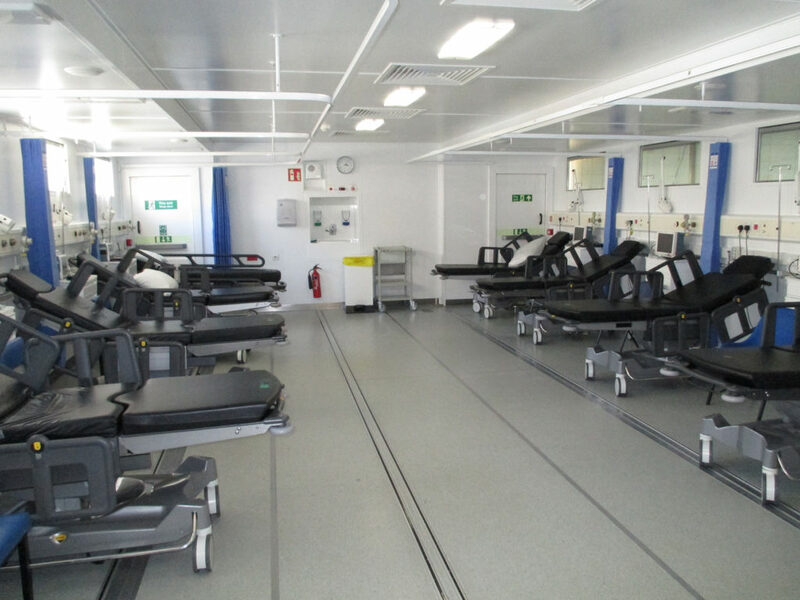 This is a strategic combination of a mobile operating theatre and an eight-bed recovery ward. Vanguard developed a plan alongside the estates and clinical teams at the hospital. As a result of this joint effort, the unit was in place and fully commissioned to meet the required timeframes. Vanguard also supported the hospital in staffing the unit. The visiting hospital unit was in place and operational within two weeks from delivery and offered a surgical environment on par with the hospital’s permanent facilities. The temporary unit was managed by the hospital and staffed by its own anaesthetists and surgeons. However, Vanguard provided a team of nurses and operating department practitioners to work alongside them. Working together in the visiting hospital facility, the joint team provided excellent patient care. As a result of their effectiveness, they completed 450 procedures across the two-month refurbishment period. John Findlay, Southend University Hospital’s Chief Operating Officer, told us: “The refurbishment of our theatres was essential to maintaining high standards here at Southend Hospital and the project allowed us to offer the best levels of patient care. “As a busy hospital, it was not feasible for us to lose two functioning theatres for eight weeks. The Vanguard unit allowed us to continue to treat patients whilst refurbishing our site.